Senator Dino Melaye is set to appear before a Lokoja Magistrate Court this Morning. The Senator arrived in an Ambulance around 7:00am today and was driven straight to the police A Division. It would be recalled that at the Wuse Zone 2 Chief Magistrate’s Court in Abuja yesterday he was granted a bail of N90 million. Mr Melaye was arraigned by the police yesterday on allegations that he escaped lawful custody. He was granted a bail for N90 million. 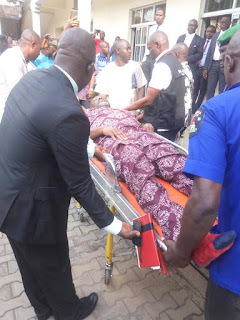 Mr Melaye was at the hospital between last week Tuesday when he reportedly jumped out of a moving police vehicle until Wednesday afternoon when he was quietly arraigned by the police. The senator was trying to escape being taken to Lokoja to face criminal trial. Some of his aides told newsmen that the Senator has been brought to Lokoja despite his fragile health.